Hindus highly value the importance of physical and spiritual cleanliness. This aspiration necessarily leads to a great integration of water into most Hindu rituals, as it is believed that water has spiritually cleansing powers. In fact, during all purification rites water is sprinkled on the objects which are to be purified. Water Therapy (Usha Kaala Chikitsa), both external and internal, has been practised for centuries to heal the sick. According to this ancient Hindu system, 1.5 litres of water should be consumed each morning on an empty stomach. Water Therapy is considered to be a material way of taking an “internal bath“. Immediately after childbirth, a close relative of the child pours a few drops of water on the body of the child using the right hand. It is said that the child will get the character of this person. As such, a close relative with good character does the ritual. Water plays a significant role in death as well. After cremation, the ashes are collected and cast into a river to travel to the sea and ocean. Most holy places are located on the banks of rivers, coasts, seashores and mountains. Convergence between land and water carries a special significance. Sacred rivers – such as Ganges – are believed to have the power to purify as much as to wash all sins away. Water and milk are symbols of fertility, absence of which can cause barrenness, sterility leading to death. Water brings life as trees and flowers bloom and crops grow. This cycle of life is seen as a metaphor for Hinduism. Conventional beliefs hold that the water of a temple tank is holy and has cleansing properties. When you enter – dressed in the traditional sarong – a temple you are supposed to accept the blessing with holy water by a priest or his assistants on the crown chakra. When you leave a temple, after your prayers or meditation (meditation is believed to be a form of a prayer that connects you with the deities) you may ask for holy water to take with you (for your family or friends who remained at home). If the gods agree (via a priest or his assistants) to give you the water, you first need to drink some of it three times (a process called Achamana), place some of it onto your third eye thrice too and finally onto your crown chakra. I first drank the holy water kept in Poorna Kumba (a pitcher of water with fresh leaves and flowers) in Ulun Danu Beraten temple. As a Western person my first thought was: “Should I be doing this? Is this clean? Can I get sick from this?” Actually, if I had had any stomach issues till then, after I drank the holy water, even the minor ones disappeared! 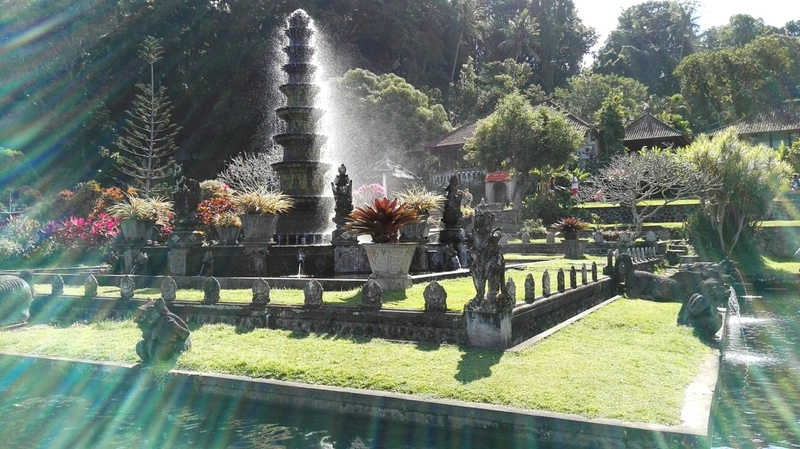 Don’t ask me how that is possible but since then I never doubted the holy water again and when I took my first plunge into the holy water in Tirta Empul temple, I felt completely safe and I knew the pure mountain water which has been blessed and which is believed to fulfil wishes can only do me good. As for the name of the temple: Water offered to the Deities and the water collected after bathing the Deities are considered sacred. This water is offered as “Theertha” or blessed offering to the devotees. People from all over the world come to this temple to perform a bath in the holy water for the achievement of some desire (this procedure is called Kaamyasnanam, while Prokshana is sprinkling water over one’s body to purify when a bath is not possible). The purifying bath in the Tirta Empul near Ubud has been a strong experience for me, I remember I got completely lost in my prayers while standing under one of the springs. It felt like the water has pervaded every single cell of my body and every essence of my soul… when I got out of the water, as if in a state of complete trance, some people on the bank came to me and asked if I am a Hindu that my praying strongly spoke to them though they are atheists. I said I am not a Hindu but a strong believer… you see, there are so many connections in between the existing religions that I do not feel the need to define myself within the boundaries of one of them when the phenomena are overlapping and they simply hold different names… like, take the story of Noah´s Arc in Christianity for example and compare it with the fish avatar (Matsya Avatara) of Lord Vishnu and the story that says that the fish avatar has appeared to King Manu while he was washing his hands in a river. This river was supposed to have been flowing down the Malaya Hills in his land of Dravida. According to the Matsya Purana, his ship was supposed to have been perched after the deluge on the top of the Malaya Mountain. A little fish asked the king to save it and, upon his doing so, kept growing bigger and bigger. It also informed the King of a huge flood which would occur soon. The King built a huge boat, which housed his family, 9 types of seeds, and animals to repopulate the earth after the deluge occurred and the oceans and seas receded. Even in Bali, the Hindus hope to take a bath one day in the sacred Ganges river. There are six other sacred rivers in India but this one is the most important of the sacred rivers. It is believed that those who bathed in Ganges and those who leave some part of themselves (hair etc.) on the bank will attain Swarga or the paradise of Indira. The river is referred to as a Goddess and is said to flow from the toe of Lord Vishnu to be spread in the world through the matted hair of Lord Siva. Many Hindus believe that the water from the Ganga can cleanse a person’s soul of all past sins, and that it can also cure the ill. I have always believed (especially as an Aquarius) that water connection is essential to any human being. We are 70–80% water and the lightness we feel when we swim in pristine clear waters can barely be substituted by anything else. We build cities around rivers and any town without a river or a lake or a sea would somehow give a feeling of infertility. Almost all the renowned cities of the world would have their most beautiful parts and centres located on river banks or coastlines. I love swimming, especially somewhere where the water source is natural and clear. I have always felt a strong connection to something transcendental when “in water”. 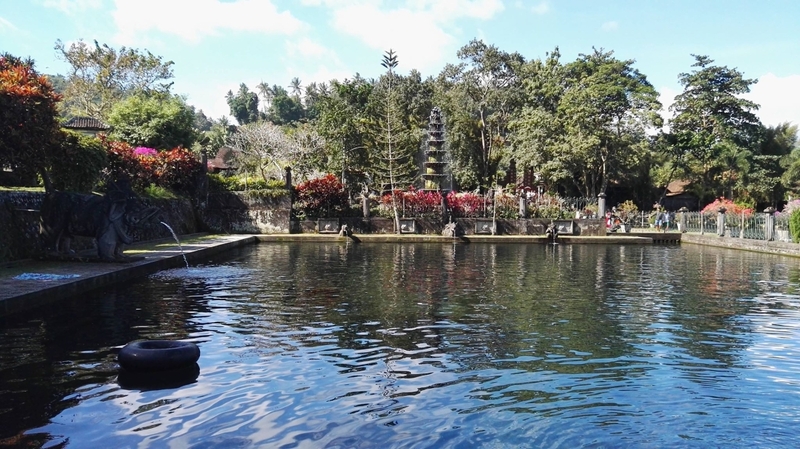 When I went swimming in the Tirta Ganga water palace, that feeling became truly intense. The water was pristine, just like in Tirta Empul, there were Chinese carps and other fish inside so I could swim among them, hear the water springs around the swimming pool made of stone and fully enjoyed the cool water not spoiled by chlorine or other chemicals that are normally used in public swimming pools. 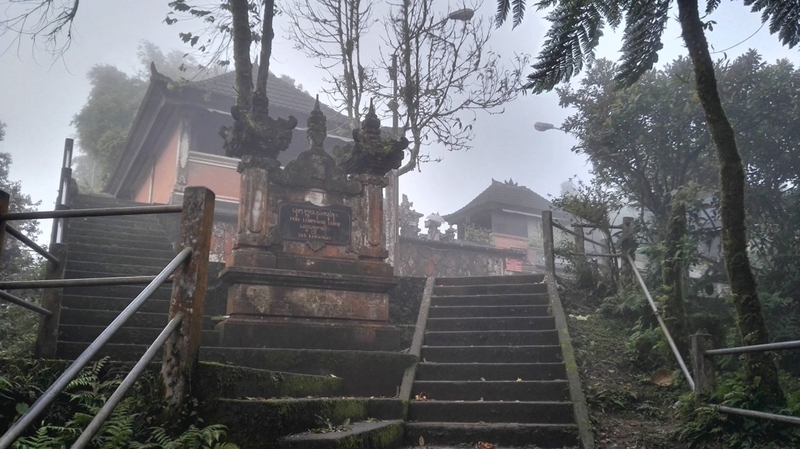 On the same day I went to Tirta Ganga I undertook a hike up to Lempuyang Luhur temple, which is situated on the peak of Mount Lempuyang (1175 m), 6 km away from the base temple (there are altogether seven on the way up to the peak). One of Balinese most ancient and holiest temples gets little tourist traffic since the 1800 steps, clouds gathering half way through the trail, drizzle, coldness, daring monkeys on the way and the loneliness one encounters on the way (especially when you go up in the evening, shortly before the sunset, when even the stallholders walk down) going altogether through seven sanctuaries is very demanding, not just physically… the views and the spirit found on the way is, however, worth every step and tear and emotion of the “journey of oneself, through oneself, to oneself”… When I got my lowest moment on the trail, thinking that I cannot make it, I remembered the lightness and the vital power I felt when swimming in Tirta Ganga. It worked out for me and I walked up all the way, enjoying the drizzle falling down as it helped me feel more connected with the transcendental. Another “connecting” moment I experienced on Bali was when I went to the Git Git waterfalls. I – sadly – was not allowed to swim in the waterfall, but I did anyway in some of the minor confluents. 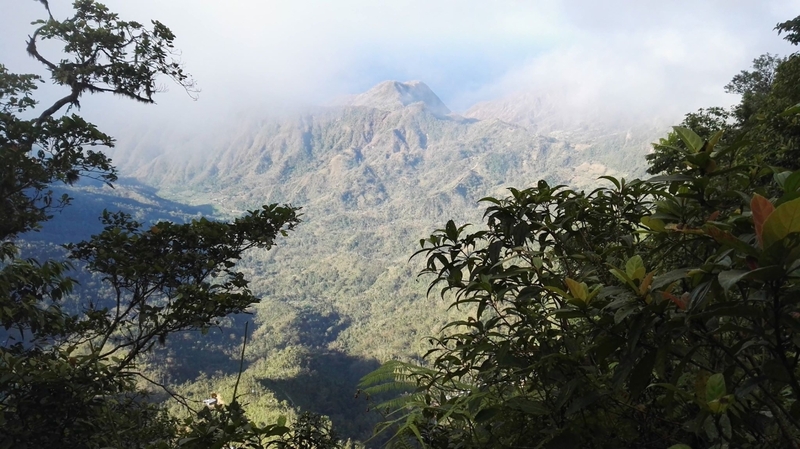 It was invigorating and I walked back from the place with my sandals taken off, barefoot. 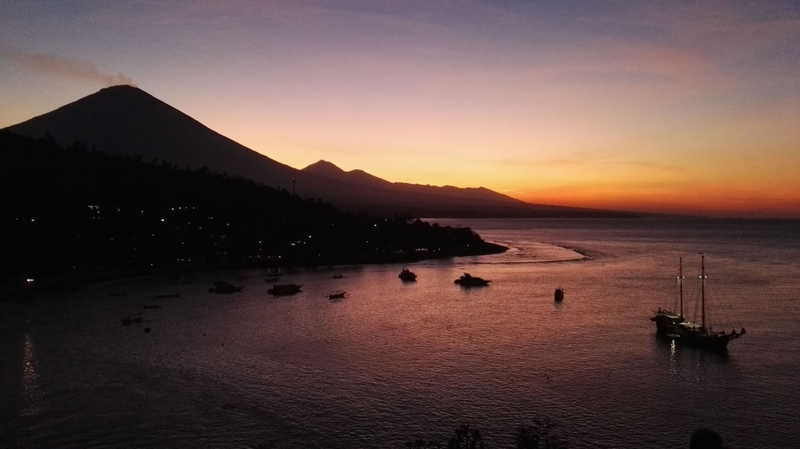 There have been many moments on the island when I understood just what water truly means to me… the final one arrived just shortly before my departure, when I went for a discovery, i.e. 10m dive in Tulamben to see the US navy shipwreck. There are corals and various fish and even turtles around the place and even the wreck itself is quite a thrill, though when one goes deeper inside the guts of it the energy of the drama grows thicker and denser. I enjoyed mostly swimming along the wreck watching the colourful fish nibbling on the growing corals as the sunrays shone through the water and offered a spectacular glowing parade.